The award winning Prestwick Country Club is a premier Myrtle Beach championship golf course and an extremely popular one for locals and tourists alike. Golf Digest named Prestwick “Top 5 Best-Kept Secrets in America”, but the word has gotten out, and for good reason. Pete and P.B. Dye laid out a real beauty when they designed Prestwick Country Club. Pete Dye used the natural creeks and lakes while incorporating his unique style of man-made mounds, extensive bunkering and bulk-head guarded greens. The fairways wind through dense forests and extensive waste bunkers to lead up the well- guarded greens. Avoiding the many obstacles can be challenging and also rewarding, as there are several risk-reward opportunities. 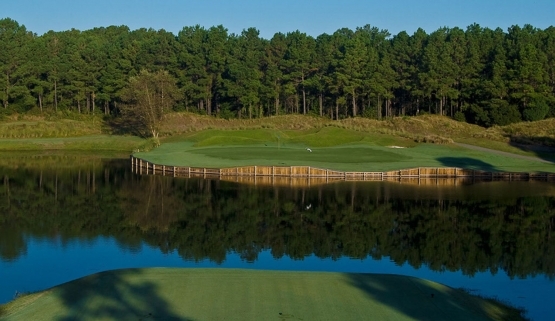 Golfers of all skill levels will enjoy this beautiful Myrtle Beach golf course. The secret is out and Prestwick Country Club would be a great course to include in your Myrtle Beach Golf Authority golf package. Myrtle Beach golf packages offer the very best in Myrtle Beach golf deals along with the very finest in Myrtle Beach accommodations. While visiting the Grand Strand it would be the perfect place to tune up your game with a Myrtle Beach golf lesson from a Myrtle Beach golf instructor. Beautiful golf courses, great golf and lesson opportunities are waiting for you to book your Myrtle Beach golf package today!